Not very long ago, I read the book The DUFF by Kody Keplinger. I must confess that the only thing that really compelled me to read this book was the fact that the movie adaptation was coming out soon and I wanted to compare the book to the movie. DUFF stands for Designated Ugly Fat Friend. In The DUFF, Bianca Piper learns that she happens to be the duff of her group of friends from the seemingly archetypical high-school jerk, Wesley Rush. Wesley tries to explain that the duff in a group of friends isn’t necessarily fat or ugly, but before he can, Bianca gets so insulted that she throws her cherry coke all over him. She soon begins to think that he may be right. Soon enough, her family life begins to turn into a disaster and Bianca starts to ditch her friends for Wesley. The novel, despite its superficial and somewhat-inaccurate allusions to The Scarlet Letter and Wuthering Heights, is good for a fun read. It’s no work of art and will probably not even garnish a cult following like some other young adult books, but it’s noble in the message it is trying to convey: labels don’t matter because at the end of the day, there are always going to be people better than you and people worse than you. A short time after reading the book, I got to see the movie The DUFF. It’s rare that movie and TV adaptations are as good as or even better than the original book, but I can say that the movie is as good as (if not better) than the original novel. The movie managed to give Bianca’s friends, Jessica and Casey, actual character instead of making them “Bianca’s dumb friends.” The movie toned down what might be seen as being too racy, especially for teenage characters and a teenage audience. There were also a few funny one-liners. Reviews have compared this film to Mean Girls and Easy A. While the humor is not quite as biting as Mean Girls and is not cleverly tied to a literary classic like Easy A, it’s still a funny movie that’s worth going to see. This entry was posted in The Arts on April 27, 2015 by The Quill Editors. 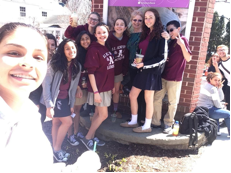 On April 3, Madame Kuhn and some of her French students traveled to Papermill Play House in New Jersey to see the musical adaptation of Victor Hugo’s “Hunchback of Notre Dame.” The production starred Michael Arden who was previously featured in an episode of “Grey’s Anatomy”, and also starred in “Bride Wars,” and the talented Ciara Renee. The play unfolded the story of a sensitive, innocent deformed man named Quasimodo, who was living in the city of Paris in the late 1400s. It showcased his journey as he struggled to face the prejudices of the church, and his awakening feelings for the gypsy, Esmeralda. The students had studied the story before coming, and after watching the play, the students were very satisfied with the way the play was staged. The set was marvelous, and the story was told in a way that captured the audience, making them feel like they were being transported into Paris in the 1480s. The actors managed to captivate the audience with every single move they made, and cause a wide range of emotions for the audience. Whether it was happiness, anger, or sadness, the audience managed to experience it all. With such a tragic story, and dynamic characters, the production was considered to be a success. This entry was posted in The Arts on April 15, 2015 by The Quill Editors. This Spring Break away from school, our SIA Baseball team traveled to sunny, warm Orlando, Florida to experience Spring Training at Disney’s ESPN Wide World of Sports. After a good flight, we hit the ground running as soon as we landed, checking into our rooms at Disney’s Caribbean Beach Resort, then registering at WWOS, and finally getting a practice in to cap a long first day. We played six games over the course of five days against some very good competition from teams from the northeast region who were also trying to escape the cold weather and snowy conditions. 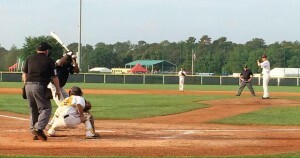 It felt great to be on the field in 87 degree temperatures playing the game I love with my teammates. The experience was awesome: it was like we were minor leaguers getting ready for the season, trying to make the big club. It brought back many fond memories for our coaching staff who shared with us their spring training experiences when they played in high school and college. After spending our days on the diamond preparing for our season, we were able to unwind at night. We visited Epcot where we enjoyed a team dinner at Via Napoli in Italy, Cuban cuisine at Bongos in Downtown Disney, and ’50s Prime Time Cafe in Disney’s Hollywood Studios. While there, we also rode the Tower of Terror. We attended a MLB spring training game between the Atlanta Braves and the Philadelphia Phillies, and the last night we were there we spent at Magic Kingdom and saw a spectacular fireworks show. Unfortunately, we lost all six of the games that we played, but we were able to play baseball in the warm weather, learned some things about each other, ate some good food, had a lot of fun and bonded as a team. All in all, it was a great experience for our team and the memories we made will last for years to come. This entry was posted in Athletics on April 9, 2015 by The Quill Editors.